Award-winning ManTech program to create a new kind of blast-resistant aluminum vehicle hull resulted from a variety of new and existing R&D. During the autumns of 2014 and 2015, the Army demonstrated a force protection capability using a newly designed aluminum hull for combat vehicles. 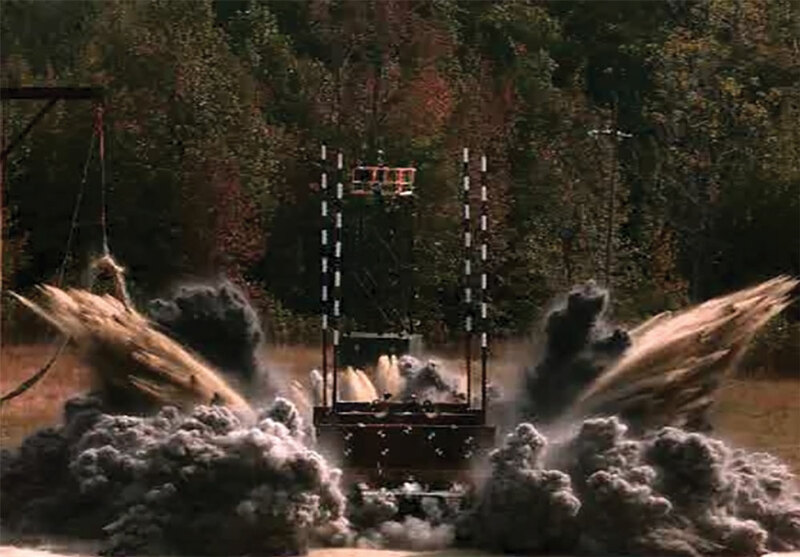 These tests involved a large underbody blast gauged on enemy threats as part of the U.S. Army Manufacturing Technology (ManTech) project called Affordable Protection from Objective Threats (APOT). After the APOT team outfitted the BH&Ts with energy-absorbing and impulse–mitigating technologies and anthropomorphic test devices (crash dummies), the BH&Ts were tested with an explosive charge significantly larger than a previous test or a typical improvised explosive device (IED) used by adversaries in Iraq and Afghanistan. Assessments of the dummies indicated limited or no injuries. Results from this collaborative effort provided experts at the U.S. Army Training and Doctrine Command (-TRADOC) Maneuver Center of Excellence (MCOE) with data to write requirements for underbody blast protection. The APOT ManTech project advanced lower hull manufacturing technologies for aluminum-hulled combat vehicles and provided a better means of maturing several structural features for validation and incorporation into the Armored Multi-Purpose Vehicle. The program achieved these results—and received the 2017 Defense Manufacturing Technology Achievement Award—through cooperation across multiple agencies, programs and even nations. Aluminum-hulled combat vehicles historically have been vulnerable to underbody blasts. Fielded in the 1960s, both the M113 Armored Personnel Carrier (APC) and M551 Airborne Reconnaissance Assault Vehicle were required to be air-droppable, which restricted their weight and corresponding aluminum armor thicknesses. Requirements writers at the time deemed anti-tank mine resistance to be impractical for air-droppable vehicles; therefore, these vehicles were developed with only a modicum of blast resistance, equivalent to an anti-personnel mine. Their vulnerability to underbody blast events soon became evident when they were deployed in Vietnam. Fielded in 1981, the M2 and M3 Bradley Infantry Fighting Vehicles featured a lower hull similar in design and armor thickness to the M113 APC, with the exception of an additional steel armor plate under the front third of the vehicle. It too proved vulnerable to underbody blasts, in this case IEDs in Operation Iraqi Freedom, so a steel add-on armor kit for the Bradley was fielded expediently. However, when this configuration was tested by the Office of the Secretary of Defense Live Fire Test and Evaluation (OSD LFT&E) program in 2012, the results indicated “severe vehicle and occupant vulnerabilities.” OSD’s evaluation set the foundation for the APOT effort, which began in 2012. The APOT ManTech effort sought to mature more effective manufacturing methods to provide protection not only from typical conventional underbody blast devices, but from blasts many times the power of a typical IED explosion (defined as objective level) and significantly more than the amount of explosive used in the OSD LFT&E evaluation of the Bradley. In after-action accounts of hull failures caused by large underbody blasts, battle damage assessments noted that hulls failed because of welds rupturing and the relatively thin aluminum belly plates fracturing. To mitigate these failures, APOT sought to fabricate thicker aluminum hulls using fewer welds. Specifically, APOT matured the forging of a monolithic aluminum hull; the forming of a hull from thick aluminum plate; and the welding of thick aluminum plate using high energies, which reduces the number of weld passes by up to 90 percent as compared with typical hand welds. Industrial partners for these efforts were Alcoa Defense with Alcoa Forgings and Extrusions (now Arconic Inc.), Constellium N.V. and BAE Systems Inc., respectively. The forged-hull effort was the first innovation and is the focus of this article. Stakeholders from the U.S. Army Research, Development and Engineering Command (RDECOM), the Program Executive Office for Ground Combat Systems (PEO GCS) and the MCOE determined the desired results for the APOT project. PEO GCS experts sought affordable hull designs with integrable manufacturing techniques, while the MCOE needed hard data to inform underbody blast requirements being drafted for a number of programs. While experts agreed that manufacturing a lower hull and live-fire testing with an explosive charge similar to an IED would be useful, that would not answer the essential question: “What does it mean for force protection for the Soldier?” Experts concluded that to answer this question would mean taking the lower hull and fabricating an entire BH&T, installing energy-absorbing seats and floors along with crash dummies, conducting live-fire testing and then assessing injuries. 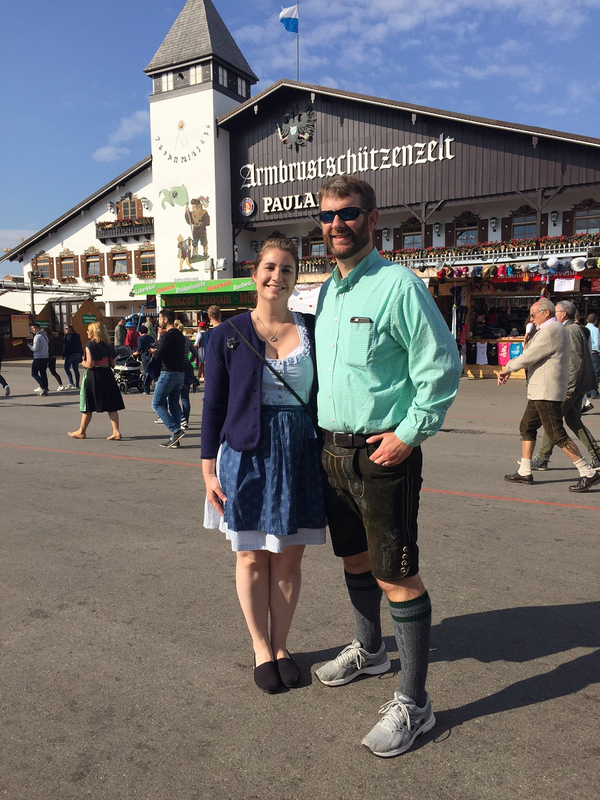 To accomplish all this, the team looked for partners. Fortunately, at the time, the Defense Advanced Research Projects Agency (DARPA) Soldier Protection Systems (SPS) program was also “developing and demonstrating lightweight armor material systems to defeat current and potential ballistic and blast threats with performance substantially better than today’s protective armor systems.” As part of that effort, it awarded BAE Systems a project to develop an aluminum combat vehicle hull capable of withstanding very large underbody IED blasts. Collaboration among APOT, SPS and BAE Systems project managers led them to agree that the APOT underbodies would form the basis for the SPS designs. Select designs would be fabricated into BH&Ts to demonstrate the first element of force protection. The forged hull effort kicked off in summer 2013; APOT forming and welding efforts started a year later. Acquisition stakeholders required material used for the hull to be weldable using conventional Army practices, and TRADOC requested data in one year. 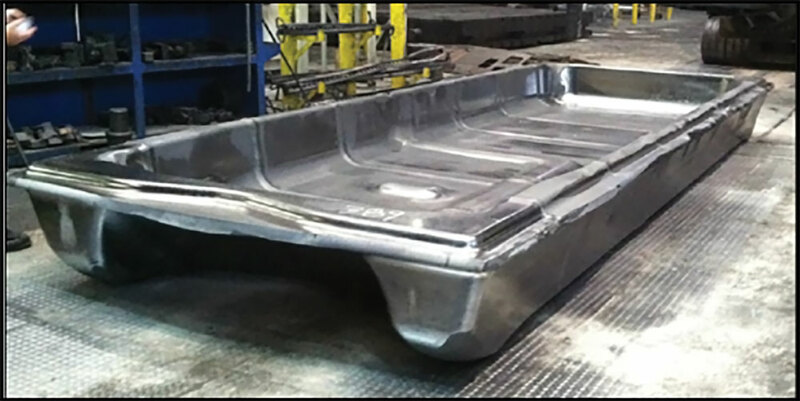 The APOT effort was scheduled to produce a hull in 18 months; however, Alcoa made it possible to accelerate the program by funding the massive 180-ton steel die set required for forging. During fall 2013, the forged hull geometry was developed and refined through modeling and simulation. The hull design, along with the material requirements, drove the team to select a European aluminum armor alloy, 7020, which had never been produced commercially nor forged in the United States. Fortunately, the U.S. Army Research Laboratory (ARL) studied aluminum alloy 7020 in a 2011-13 foreign technology assessment program and developed a good understanding of its weldability and ballistic response. However, as 7020 had never been manufactured in the United States, the Army needed to develop the alloy chemistries and process parameters for large-scale domestic industrial production. In fall 2013, the U.S. Army and the Israeli Ministry of Defense were closing out capability assessment activities as part of the Ground Combat Vehicle analysis of alternatives. The Israelis learned of the forged hull effort and expressed interest in collaborating. Since high-performing, energy-absorbing technologies were required for the BH&T, a U.S.-Israel project agreement on armored vehicle underbody blast testing allowed energy-absorbing technologies developed by Israel to be adapted and installed into the forged BH&T. During this time, RDECOM’s Tank Automotive Research, Development and Engineering Center (TARDEC) was executing the Concept for Advanced Military Explosion-mitigating Land (CAMEL) Occupant Centric Protection Technology Enabled Capabilities Demonstrator. 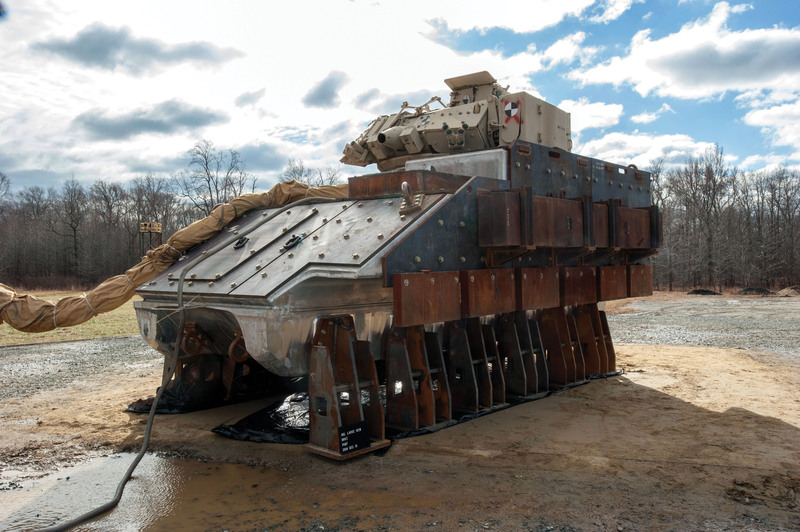 As part of this effort, TARDEC developed high-performing, energy-absorbing seats and floors for the CAMEL wheeled combat vehicle demonstrator. The APOT program presented a great opportunity for the engineers working on the demonstrator to determine the effectiveness of its technologies in the APOT BH&T. Additional energy-absorbing seats were provided from ongoing DARPA and ARL efforts. By spring 2014, all of the R&D projects were effectively aligned, and as a result, the APOT program began to make rapid progress. Alcoa forged the one-piece aluminum hull, the largest aluminum forging ever performed. BAE Systems worked rapidly to fabricate the BH&T from the forged hull and to install the energy-absorbing technologies. The BH&T was delivered and outfitted for the live fire test. While the assessment showed injuries to the crash dummies during testing, the forged BH&T itself was relatively unscathed. Subsequently, the BH&T was refurbished, re-outfitted with the same energy-absorbing technologies, and through an RDECOM CRADA, TenCate Advanced Armor USA provided and installed an active blast defense system. The BH&T was again tested with an objective-level charge, with remarkably positive results. Through the effective alignment of multiple R&D efforts that brought together alternate manufacturing methods and advanced protection technologies, the project answered the essential question, “What does it mean for force protection for the Soldier?” For this case, no injuries occurred in an objective-level underbody blast test. The Army ManTech APOT project matured lower hull manufacturing techniques and demonstrated aluminum hulls that can withstand objective-level underbody blasts. In addition, APOT served as a focal point to bring together a number of R&D efforts from several DOD agencies, along with SBIR, CRADA and international activities, which collectively answered the essential question and demonstrated what can be achieved through careful planning and collaboration. This work has had an impact on both current vehicle design and future vehicle requirements, ensuring a lasting legacy for the APOT effort. For more information, go to http://www.armymantech.com/APOT.php. BRYAN CHEESEMAN is the rapid technology transition team leader for the Materials and Manufacturing Sciences Division at ARL, Aberdeen Proving Ground, Maryland. He received his Ph.D. and M.S. in mechanical engineering and a Bachelor of Mechanical Engineering from the University of Delaware and joined ARL’s Weapons and Materials Research Directorate in 2000. He is the recipient of the Army Achievement Medal for Civilian Service and the Defense Standardization Program Award for Excellence. This article is published in the January – March 2018 issue of Army AL&T magazine.